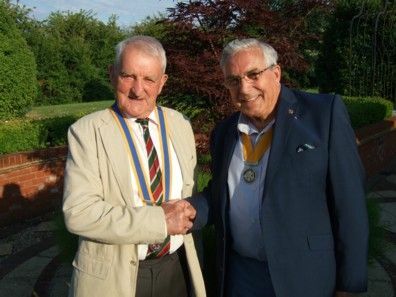 Tom Cornwell took over from John Menlove as President of the Rotary Club of Cranleigh at the Club meeting on 2 July 2015. He will remain in office for one year. Tom has lived and worked in the Cranleigh area for many years, and still meets many people through the family business, Celebration Cakes, in Cranleigh High Street. He is looking ahead to a busy and successful year under his leadership. 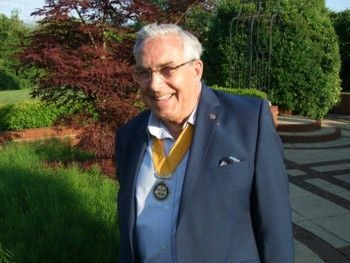 "Having joined Rotary in 1972 and become President of the Rotary Club of Cranleigh in 1981/82, I have once again been chosen to lead the Club for another year. Perhaps the members think I could make a better job of it this time! The theme for this Rotary year is "Be a Gift to the World". Cranleigh Rotary has always been very active in supporting events, not only in Cranleigh but around the world. On our Rotary website we have 49 activities listed with which the Club is involved, and in many of these we are raising money for the community and around the world who are a little less fortunate than we are. Within the Rotary Club of Cranleigh we try to provide service, leadership, integrity, and, above all, fellowship. One of our main aims for the coming year will be to increase membership in order to enable us to do even more. I would also like to feel that we can reach out to the young people of Cranleigh and nearby villages and assist in their education and development. On 26th September 2015 we are holding a Festival of Model Railways, when the money raised will go to the Children's Hospice in Guildford. We hope that as many railway enthusiasts as possible - young and old - will come and join us for a great day."